It seems that one of the hottest new market trends is the pay via your mobile phone market. These new markets are emerging so that you, the consumer, can find it even easier to pay for something in a way that isn’t really anymore complicated than launching an app on your iPhone. And your iPhone is exactly where the focus started, but now is expanding to Android power devices as well. Square seemed to be the first pay by phone system to hit the markets. Square allows any iPhone or Android powered device to simply add a little device to your mobile phone and you’ll then be able to swipe your credit card and make your payment. 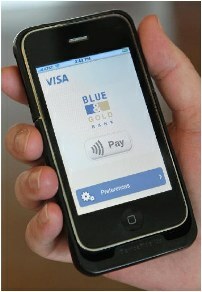 And now Visa is jumping into the pay by mobile phone market with their own payment processing system. To pay at any of Visa’s swipe-free payWave payment terminals, already found at over 32,000 retailers nationwide, all you would need to do is tap an app in your DeviceFidelity-encased 3G or 3GS iPhone and wave it over the terminal. Retailers like the system because it saves them time on each transaction, according to Visa [via Wired.com]. There was no mention of the Visa payment system being available on Google Android powered devices. But should the Visa payment system start doing well on the iPhone, you better believe that we’ll be seeing it hit the Android powered devices shortly thereafter.